A couple of months ago, when this site was still a germ of an idea waiting for a name (which took a long, long time to come – and yes, I did reject other ideas before settling on Painted Wooden Cubes, if that’s believable), I attended a talk at Oxford’s Taylorian Institute given by Chris Bateman, the designer of PC and Playstation game Discword Noir (and numerous others), and author of Imaginary Games, recently published by Zero Books. Since the talk, I’ve had a chance to look at Imaginary Games and there’s a good deal to like in it. While Imaginary Games begins by highlighting Roger Ebert’s claim that ‘games can never be art,’ thankfully it mostly avoids a hackneyed defence of games as art. It considers what games share with art, but blessedly does not try to collapse one into the other. I don’t intend to talk about all that Bateman says on the subject – I wouldn’t do justice to a fine book by skimming so superficially over all its ideas. Instead, I’ll focus on the suggestion Bateman makes that both games and art must be understood as representational, even in their most abstract examples. 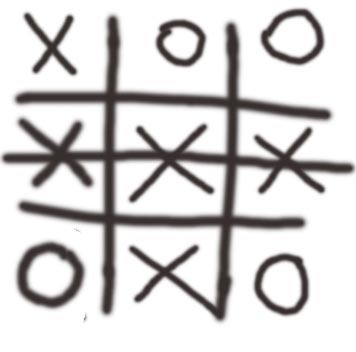 Bateman highlights Noughts and Crosses as an extreme example, the hash mark grid of which he feels ‘can be seen as a prop prescribing that the players imagine nine positions’ (100) (This, like much in Imaginary Games, very much rests upon Kendall Walton’s prop theory). Similarly, a chess knight is argued to be a spur for imagining a set of rules for its movement, rather than a real knight. Board game pieces, then, are a often a short-hand for rules – even the houses and hotels in Monopoly, another example Bateman highlights, are imaginatively more connected to the game’s rules than to real buildings. 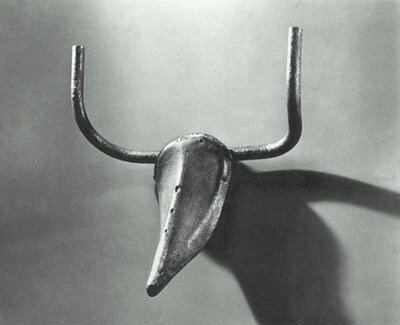 This might seem unlike art, but – as Bateman conveyed well in his talk – the viewer must understand certain conventions to appreciate art: He highlighted Picasso’s ‘Head of a Bull’, made from bicycle parts, and suggested that many untutored in art fail to see the bull they represent. Whatever the proportion of people who do and don’t see the bull, there’s clearly much to be said for emphasizing the fact that both art and games depend upon rules to be appreciated. The film Scream comes to mind for me – how little sense would that film make to somebody who had never seen a horror film before? That board game are generally sold with a printed rule-set for interaction with them makes them someone particular as a cultural item, but it is valuable to remember the existence of (at least implicit) rules for interaction with other cultural products. 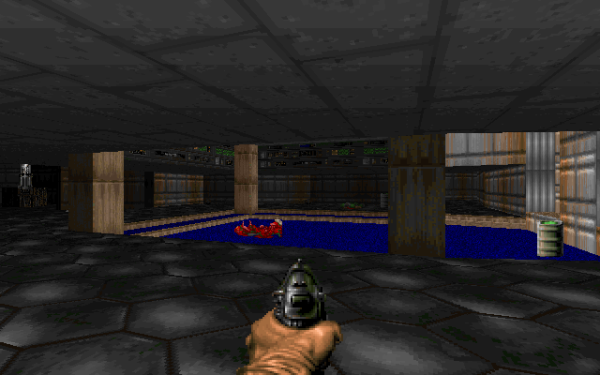 However, in linking rules to props – a useful idea – Bateman appears to blur two concepts: that a game is a prop, and that a game employs props. The point is often the same, that the prop – whether the game, or an item within it – stimulates particular imaginative and intellectual experiences, but Bateman could do more to explain how he feels the prop-within-a-prop relationship functions. It’s something I would like to consider more myself sometime. Moreover, Bateman offers a hierarchical ranking of imaginative experiences which I find unhelpful: He contends that D&D-style role-play, which requires a great deal of imagination from participants, offers a higher experience than a video game series like Doom, which is situated in a (pseudo) 3d world, visually and audibly rendered for the player (who is therefore argued to need less imagination to participate). It seems to me that Bateman disregards the imagination spurred by a game, but not directly utilized in playing it: The hundreds of Doom wads and mods I remember playing (and the many thousands I never did) testify to a wider game-culture of which the 24 levels (and three secret levels) of the original game represent just a small part (Never mind more nebulous inspiration – how many other games, how much fiction, how much art and music has Doom spurred?). Similarly, though board and games occupy a higher place within this system, it doesn’t seem that the only imaginitive experiences spurred by, say, poker and Puerto Rico occur whilst those games are being played. Nonetheless, I really found a great deal to appreciate both in Bateman’s talk, and in Imaginary Games. With respect to the latter, I’d also like to mention Bateman’s fine writing style. His voice throughout Imaginary Games is authoritative, yet playful – which I feel represents an appropriate register with which to be talking about games; Bateman, I think, recognizes that to write successfully about games, there must be room in the text to reproduce the fun which lies behind most play; in this much I feel Imaginary Games offers a fine example for similar works in the future. Thanks for your thoughtful review, Mark! I have a couple of comments. I do not mean to suggest that a more imaginative experience is a higher experience. In fact, aesthetically, I’d say that Dungeons & Dragons games are inferior artistic experiences to, say, the films of Akira Kurasawa. The hierarchy is intended to draw attention to the degree of imaginative faculty required to imagine particular activities – but something could be low on this scale and yet more worthy of cultural esteem than something higher up the scale. My apologies if I implied that a need for greater imaginative activity necessarily meant better. Thank you, Chris – firstly for reading this and helping me where I’ve misunderstood – but also, and more so, for writing a fine book in the first place. I’m keenly waiting to read The Mythology of Evolution – if its title isn’t misleading, it’s close to my own area of research (literary representations of evolutionism), so I’m very interested to see what you have to say. Seriously, thank you for pointing out something I hadn’t realized about my presentation – I can see now how it could seem like I’m making aesthetic rather than cognitive claims when I talk about difficulty to imagine. I’ll bear this in mind next time I present the material. Glad to hear some interest for ‘The Mythology of Evolution’! I finished writing it earlier this year, but it isn’t going to be out until the latter half of 2012, unfortunately – the wheels of publishing turn so damnably slow! It might connect with your research area, since it deals with the role of fiction in science and particularly evolutionary biology, although it does so in the context of scientific and philosophical papers rather than specifically in literature. I’d be happy to send you an advance PDF of the book once the publisher has wrangled it (some time early next year) if you email me your contact details. If you have a spare moment, can you put a capsule review of ‘Imaginary Games’ on Amazon (.com or .co.uk)? I don’t have any Amazon reviews yet, and they’re terribly helpful. Happy Winter Festival of your choice! Chris, I’d be delighted to have the chance to look at a PDF of The Mythology of Evolution when it’s ready. Thank you very much. I’ve also put a review Imaginary Games up on Amazon.co.uk.